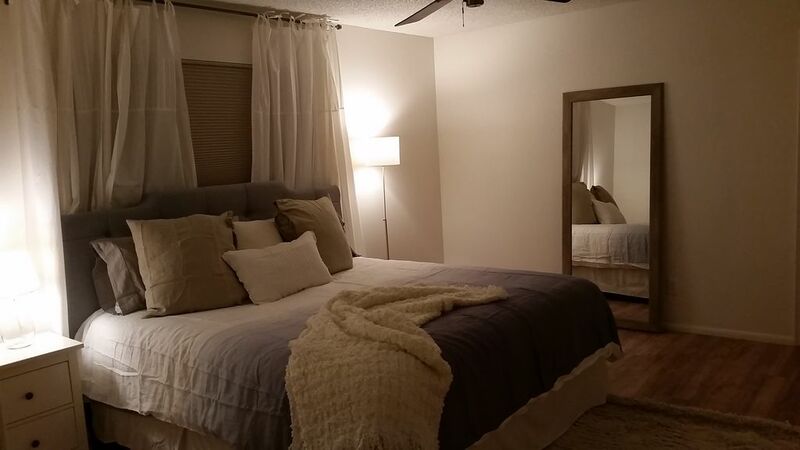 3 bedrooms, all brand new beds, 2 baths, sleeps 8. Great getaway! Single level home in a safe and quiet neighborhood. Large crystal clear pool in yard with great green lawn area. Close to everything!! Spring training, airport, and shopping all close. Great entertaining home with large dining. 1 king, 1 queen, 1 trundle bed (2 twins), couch fully reclines downflat in 3 places, (extra options: Port a crib, queen air mattress). Fully equipped kitchen, granite and top of the line appliances. $100 cleaning fee. $150 a night. $25 nonrefundable pet deposit. We love Phoenix. As a kid I grew up in Phoenix and have continued to return regularly to bask in the blue sky's of the city. Our 4 children travel back and forth from Flagstaff to participate in the many sports teams the city offers. We are so excited to share our home with you! The central location of this property and extremely quiet neighborhood drew us in and captured our hearts. Our kids play in the pool for hours, running back and forth from the grass to the pool. We love the desert landscaping of the front yard and the giant saguaro cactus has tons of bird activity to watch. Such a great home. LInens for all beds, and extra blankets and pillows. Huge sectional that reclines fully in 3 places. DirecTV. Granite. All stainless steel top of the line appliances. Coffee maker. Ice maker. Hand held mixer. Garbage disposal. Microwave. Dishwasher. Kitchen nook seats 4. Dining room seats 6-8. 58'' TV, Brand new. New Tv in master bedroom as well. Beautiful, lush green lawn. Fenced completely in and safe for pets. Patio furniture. 2 chairs, one coffee table, 1 love seat. All with cushions. From the moment we got there to the moment we left we loved every minute. This home made our vacation & I will rent it EVERY time I'm in the Phoenix area if it's available. It was a great size for our family. It had everything we needed. The kids loved the pool. I loved the fact we had a garage to pull right into. It felt very "home" like! Felt safe & secure. Quiet neighbors. Best decision I ever made on a vacation. And the owner is easy to reach if you need anything & very helpful. That's the kind of person you want owning a rental & letting you enjoy the privilege of using their rental home for your stay. No complaints whatsoever. Was every tiny thing perfect? No. But that's normal. It WAS the perfect rental for my family & would be for anyone. That's my opinion. Top notch service & great house. Thanks again Sarah! We will see be back if we aren't actually moving out there the next time we come. Lol.. I'll either be buying a house to stay for good or utilizing your rental again on my next vacation. That's for sure!! We had an excellent stay at Sarah’s home. The house was clean and well supplied. The backyard and pool were amazing. We would definitely stay here again. House could have been better and cleaner. We are not relatives visiting and expect to have a clean, fresh house. This is the worst rental we have stayed in. Overall, the house needs a deep cleaning, painting and updating. There was grime on the walls, dirty and dusty floors. Closet doors at so dated and barely functional. Main bathroom’s shower curtain liner is gross.... probably been there a year and someone else’s soap was left in the shower. No spare TP in main bathroom and roll was almost empty...had to search around the house to find more TP and new bar of soap. Bathroom rug was not vacuumed and had hair and lint on it. No place to put food or drinks in living room just a couch and TV...need coffee table and/or end tables. Only 2 chairs in pool area so had to drag from covered porch. Pool chairs are very worn so you sit on the cross bars as fabric is stretched out. A/C was not on when we arrived...thermostat was actually set to heat. The house seemed like is was a frat house that someone decided to rent without really putting in effort to making it rental ready...would never recommend. Great place for family vaca. Clean, roomy and fun! Easy access to 17. Loved the larger home. Very clean. Perfect family getaway. Would definitely stay again. Beautiful property with a great deal of room. Back yard and pool are wonderful. The only issue is the shower in the master bathroom makes a high pitched noise and sprays erratically. Great for spring training games! Peoria Sports Complex is closest to us, this is the San Diego Padres and the Seattle Mariners Stadium, but all the teams play here. Nextra 2 closest stadiums are the Maryville Stadium (Milwaukee Brewers), and the Camelback Ranch (Dodgers and Chicago White Sox. * watch kids around water.